Something in me still recoils at the word "obey" even as we tried to teach our daughters to do so. I don't often ask it out loud, but especially when it comes to rules I want to know "why?" Something more substantial than "because I said so." Israel was then commanded to keep this law in their hearts, to teach it to their children, to talk about it day and night, to write it all over their homes. This law was to be their practice is daily life ... All day, every day. And Jesus said this is the greatest commandment. 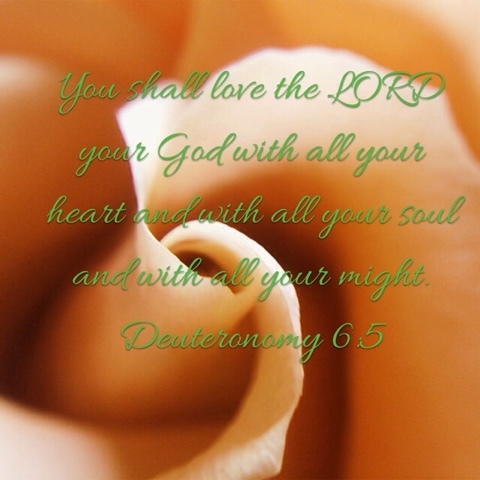 So how do we love God? What does that look like? Do we volunteer more? Attend church more? Pray more? Read our Bible more? Fortunately the Bible has given us very clear instructions on how to love God. So we show our love to God by obeying Him. Even if it doesn't make sense. Even if it is uncomfortable. Even if others call it restrictive. Even if it offends someone. Even if it causes us to give something up. In fact, perhaps especially then. Why isn't obedience a burden? Because we can trust Him. Because He loved us first ("But God demonstrates His own love toward us, that that while we were yet sinners, Christ died for us." - Romans 5:8). Because he is working our lives out in ways that we cannot comprehend ("And we know that God causes all things to work together for good to those who love God, to those who are called according to His purpose." - Romans 8:28). We are like little children. We don't know what is to come - we don't always know what the outcomes and consequences of our actions will be. If I tell my child not to touch something, I want them to trust there is a reason! I need to trust God just the way I want Victoria to trust me. I may be protected her from a burn when I tell her not to touch the hot stove. God's commandments were designed to protect us from harm. I want to love Him by trusting who He is and knowing the to obey Him is the only "safe" way to live my life. Even if it may seem painful at the time.